The Byron Bay Cookie Company is using the Rosella flower to create a unique flavour offering for its customers. 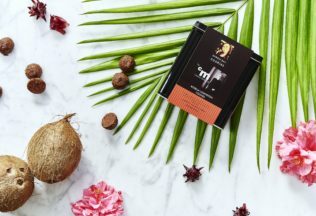 The new Rosella Lamington Byron Bay Cookie combines coconut, rosella jelly and cocoa into a bite-sized biscuit. The cookie was created in collaboration with celebrity chef Christine Manfield, who said reinventing an Australian classic, like the lamington, was an exciting challenge. “I wanted to develop a cookie flavour that would showcase Australian ingredients,” Manfield explained. The Rosella Lamington Cookie is the fourth creation by Manfield for the Byron Bay Cookie Company. Her other biscuits for the company include coconut and pistachio macaroons, salted caramel popcorn and passionfruit dark chocolate. Customers can purchase the cookie in 200g servings for a recommended retail price of AUD $ 19.95 from David Jones department stores. The cookie will also be available from cafes in 60g servings with a recommended retail price of AUD $3.50. Selected domestic Qantas flights will serve the cookies from May 2017.